Another interesting 30 hours. To avoid some drama building up in town with some people I’d gotten to know, I decided to begin exploring the other side of the island. An area known as Maribago. As you may recall from an earlier article, My First Friday on Mactan, I found myself in an area late one night with very little lighting while being followed by three somewhat annoying locals out for some easy money at my expense. I only recently learned that the area I’d wandered into that night was.. Maribago. 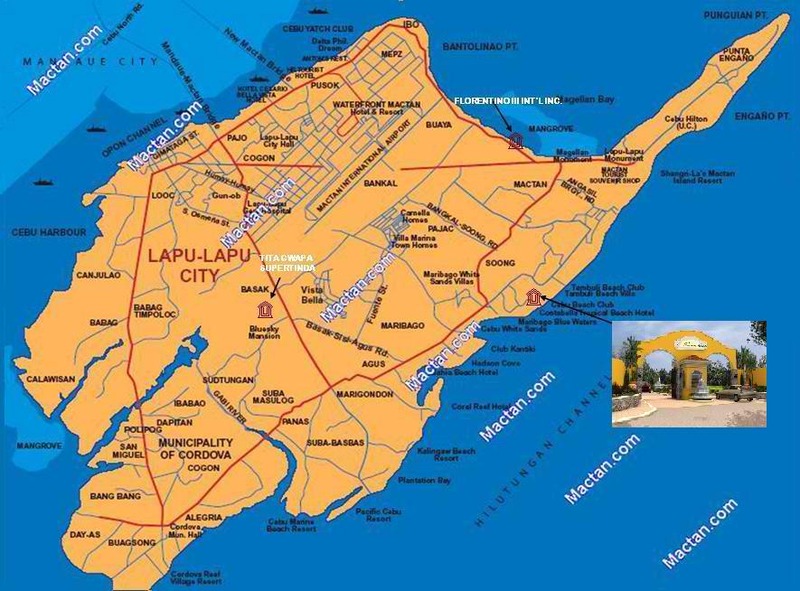 It’s central area is much smaller than Lapu Lapu and most of the locals there have constant interaction with visiting tourists because several of the large resorts along the beach surround that area. What this means is that they are accustomed to over-charging and ‘leaning’ on foreigners who are there for a short-term stay. Today I wanted to see the area in the daylight. I took a cab out there for a look-see since I’ll likely be going to the resorts a lot more once the typhoon season is over, to use their private beaches on a pay-per-day basis. The surrounding area of Maribago definitely looks better at night. During the day there is a small, 4-corners center of activity and aside from that just homes and a few small businesses spotting the road going North. I had the cab drop me off just outside the Maribago Bluewater Beach Resort since it was the only one that came to mind. I didn’t go into the resort since there was only about an hour of daylight left and I wanted to look around a bit. I walked a ways and sat down at this place where I pulled up a plastic chair and had the nice one-eyed guy cook me up some grilled chicken on a skewer. It was the whole drumstick and thigh, with the bone, on a bamboo skewer. As is common around these roadside ‘eateries’ there are usually a few dogs or cats around who know this is the place to get some regular scraps. I don’t mind that, all the dogs and cats around here are well behaved for being street animals. So, after finishing up my chicken I went into my usual ‘record’ mode that is my habit as I observed the details around me. But.. while I was busy watching the traffic, listening to the karaoke behind me, smelling the aroma of meat on the grill and soaking up the atmosphere at that time of day.. I suddenly felt someone ‘poke’ me, gently from under the table on the side of my leg. I figured some kid had snuck his way under there. I looked down and the only person there was this doggy. Scruffy, tan, medium-sized and looking at me with eyebrows upraised as if to say, “Any chance of sliding me those leftovers?” Now, mind you.. usually when a dog wants to get your attention they will reach out with their paw and either tap or drag it along your leg. Some dogs will rest their chin on your lap to get your attention at the table. 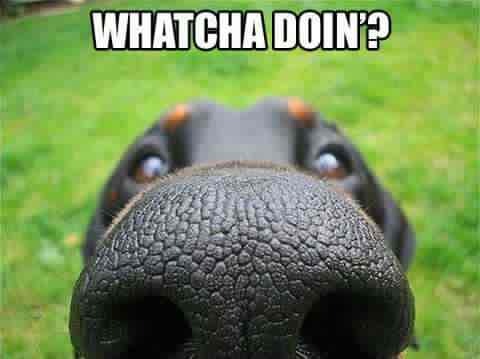 And still others will sit there and let out the sporadic half-bark/half-whine to get your attention. But not this guy. He used his nose to directly, yet very gently ‘poke’ at me. I was so astonished at his apparent courtesy that I completely missed his reason for poking me and went into a train of thought about how odd it was. Meanwhile, he waited silently and patiently. I then got some texts from some people asking me for money. Again. This had been going on since the night before and I was running out of new ways to say, “No.” I debated whether to even respond yet again to these incessant texts. And then again, I felt another gentle ‘poke’ at my thigh from the doggy at the left side of the table. ‘How odd.. you really are peculiar, you know that?“, I told the dog. In America we talk to our dogs all the time. Some people talk to dogs as if they were newborn babies with that silly gibberish tone we all know. Me, I speak to dogs no differently than when I speak with humans. I figure he’s picking up more from my vocal intonations than he is from any understanding of American English. This dog especially, since he probably only thinks and speaks the local Visayan dialect of Tagalog. Another text. Geez! Enough already. “No” means ‘not gonna happen’ last time I checked. For cryin’ out loud. I put together a labored text stating, “u shud b gettng paid by ur boss.. not payng him money.” (long story) I really hate texting. It’s so inefficient and too laborous to exercise my pet peeve for proper spelling. I set the phone down and looked off into the greenery across the street, noting how the jungle is constantly seeking to reclaim the island anywhere that lacks cement. Again, a third equally polite and gentle poke from my patient canine acquaintance. I looked at him and he gave me one of those sheepish smiles that dogs are so good at giving. Finally it sunk in. “Oh.. the bones. Yah, sorry about that. I totally got distracted.” (I did feel bad for making him wait so I felt some manner of apology was in order.) I tilted the plate to the ground and he calmly took up the bones and walked about 20 feet away to enjoy them. He was not ravenous nor did he eat with any urgency. This is his domain I dare guess and despite his somewhat rugged look due to a lack of proper bathing, he seemed to be eating fairly regularly at this spot. Smart dog. As for the cat that looked on with slanted eyes of jealousy from a distance.. she knew better than to interfere. Bad kitty-kat.. she should be out catching mice instead of sitting around, envying the dog with such looks of who knows what manner of vile imaginations. There were still about 30 minutes of daylight left and I’d seen a make-shift carnival/swap-meet along the road near a big church on the way and I wanted to check it out. There wasn’t much to see here but the entrances to the resorts so I walked over to the nearest Tricycle (Motorcycle with side-car) and asked the man reclining inside, “You know where is the big Iglesia?.. the big Church down that road where the swap meet is?” (I find myself using the same inverted order of verbs and nouns as the locals speak in an attempt to be more easily understood.) “Oh yes!“, he responded. “Okay..”, I countered, “how many pesos to get there?” Always establish the price before climbing in. There are no meters on Tricycles, only a laminated, government regulated rate-chart they rarely abide by. “For you, special price.. only 100 pesos. Climb in, we go.” He enthusiastically moved over to his motorcycle and revved the badly maintained cycle up for the trip. Now, I’m no idiot. I didn’t just stumble off the plane yesterday. I know damn well it’s barely a full mile to that church and the regulated rate is at most 15 pesos. But, as I said, being just outside the resorts he’s figuring on hitting me up with his “special price” nonsense. “100 Pesos?! To the church?? That’s way too much.”, I countered. “Okay, thanks anyway.”, I said as I walked away. I wasn’t bluffing. I need the exercise and I’d damn well rather walk the short-mile than get hit up with some over-blown Kano-rate. “Okay! Okay!“, I could hear him behind me, “..for you, I take you for 90 Pesos. Come on, get in. We go.” I didn’t even break stride. I just yelled over my shoulder behind me, “No. Thanks anyway.” and I negotiated my way across the street to begin my trek. I really do need the exercise since I sit for hours at times at my laptop. Gotta get that cardio-fix each day somehow. “That’s okay.. I need the exercise.”, I said as I kept walking and he kept putting along beside me. “Okay then.. for you, I take 80 Pesos. I take you there, come, get in.” Damn he was persistent. I stopped. He stopped, causing some minor traffic issues for just a moment. I reached into my pocket, took out my coin Pesos and counted it out in front of him on my palm. “34 Pesos. That’s what I got. That’s what I pay. You want it or not?” I felt like Howie Mandell on ‘Deal or No Deal’. “For 34 Pesos?“, I clarified. Now, like I said, that’s still double what I should have paid. The rate on the chart was 15 Pesos so I didn’t feel bad about this exchange at all. Especially since I just hate when people ignore what I say and pester for what they want. I understand the mechanics in play here, but I’m not gonna just lay down and over-pay to the hilt. If I ever do over-pay, it’s at my choice and I count it as a ‘tip’. If my change is less than 20 pesos and I got good service (which I almost always get good service here) then I’ll just tell the cashier or waitress, “Keep it.” and walk away. But get boned by an opportunist without standing for principle? No way. “Nah, I just want to get to the big Iglesia.. the Church before the carnival is over.” At the speed we were going it was going to be a long 15 minutes to travel this mile. We went through the same routine as he tried to convince me to stop at three different money-changers he knew of. Here in the Philippines, just like in Mexico, people get small commissions for bringing in customers to either the bars, brothels, massage parlors or just about any business they’ve got connections with. He then hit me up with his uncle’s boat, asking if I wanted to go island hopping with some local girls. Finally.. we were in the thick of it. It was Saturday and the streets were packed with traffic and people.. just the way I like it. I climbed out, gave him the 34 Pesos and waved at him as I left. He said something but.. I really didn’t care what it was as I immersed myself into the thick, shoulder-to-shoulder crowd around me. The next best thing I enjoy from throwing myself into a big wave at the ocean is immersing myself into a huge crowd of activity. And this place was a hive of activity. I crossed the street and, to my right was the very large Our Lady of the Sacred Heart Church. Directly in front of me was a long string of vendors along the street and a huge field of about 2 acres filled with semi-permanent booths and carnival games. It’s like the carnival came.. and never left. I made my way into the maze of booths. At the center was a fairly tall, and very old, Ferris Wheel. That was the main attraction. As is my habit, my attention was on the mechanical integrity of the motor and gear at it’s base. I’ve been on a carnival ride as a kid and had the unit I was riding disconnect and go flying into the crowd. So I trust these over-used, rusty carny-rides about as far as I can throw ’em. “That motor probably gets rained on at least twice a day.”, I thought to myself. But with all the black oil layered on it perhaps it’s insulated from harm for all I know. Either way, the kids are having a great time. Just like I did.. it’s all fun and games until you’re hurled into a crowd from some malfunctioning latch-pin that falls out. Oh well.. not my problem. It’s not my circus, I’m just here to absorb some atmosphere. I strolled around some more. Mmm.. food. Roasted peanuts. Fried chicken, cotton candy, fried squid balls, chicken skewers, sliced fruits. I stopped at a table where a 15 year old kid is running a roulette game of chance. It’s actually a home-made spinning piece of wood with payouts painted on it while a string with a piece of metal drags on it to indicate the final winning spot. And the gamblers? Also mostly kids with a few adults. Bets are anywhere from 1 to 10 Pesos. Roughly 2 to 20 cent bets, this is not high stakes gambling by any stretch. But I did find it interesting that a kid was running the show and mostly kids were the ones betting. As I moved about it turned out that perhaps 70% of the booths there were gambling booths of some kind. Guessing the flipped-card. Ping-pong ball onto a numbered grid. Tossing coins onto a table without touching the red lines. (simple in concept yet amazingly impossible to accomplish) And.. yes, almost all of them run by kids about 15 years old. Ahh.. it does my heart good to see such young entrepreneurs. These are the future Donald Trumps and Ben Seigels of the gambling world. No booze or hootchie-mommas on the premises though. Whether this property is owned by the church next door or not, I have no idea. But they weren’t doing anything to shut down these games of fortune, that much was for sure. Mostly kids everywhere. The parents were most likely next door, attending the huge Mass for Saturday night. Probably praying their kids don’t get caught up with the evils of this world. You know, with stuff like.. gambling. The few adults I did see were the extremely bored Ferris Wheel Dude and a few adults across the street getting food, booze or both. Mostly I just saw the men. The women all seemed to be at the church. God bless the Filipina women. Their prayers, faith and firm hand on the kids is what makes for the overall good moral character I’ve experienced as a whole in the Philippines. Despite the mysogeny that is prevalent in the culture, I truly believe it’s the women here who make this place function as well as it does on a social level. “United States.”, I responded. Despite his/her seeming interest in my answer he just sort of stood there, looking at me with an awkward silence. I guess he either didn’t know what else to say or was just too shy to say anything more. “From California, actually.”, I said over my left shoulder, still facing the booth in front of me. “You have no wife?“, was his next question. I’m not kidding.. without much pretext this is perhaps the most asked question in the first ten minutes I get when meeting someone here in the Philippines. Even from men looking to find a ‘rich’ Kano to marry their sister or cousin. And the women definitely want to know if you’re married once a conversation is started. Here it’s kinda automatic though, sort of like in the States when we ask, “So what do you do?” when first meeting someone. Now, I’m the sort of person who tries to go with the flow of a situation. But getting into this kind of conversation with a young changeling in the midst of a gender decision was not what I bargained for. Huh? Did I miss something? Did I adopt a kid during some drunken haze or something? Not to my recollection. I’ve seen this kid for what.. 2 minutes and already they want a replacement cell phone from me? As I recovered from the initial dose of hubris from this kid, I smiled at him and said, “Is it Christmas already?” and turned to leave. But it didn’t end there. I then hear him counter, “Then what about for my birthday? October 2nd.? ?” I just kept on walking as I said, “Can’t do that.” But you know, I give the kid credit for having the chutzpah to ask. Like the saying goes, “If you don’t ask, the answer is always ‘no’.” In this case, the answer was still ‘no’. But 100 kudos for having the balls to ask. I wandered out of the carnival area and went next door to the huge Catholic church to see what all the hubbub was about. There must have been at least 400 people there, most of them spilling out from the large building with about 100 or so outside the main area in front. It was getting dark and I noticed a long line that didn’t lead to the church door, so I followed it to the front. People were in line to approach a statue of Mary that was standing in a small, outdoor gazebo with some white lights strung around it. In the dimming dusk it looked kinda pretty.. serene perhaps depending on one’s outlook. Next to the statue was a white, wooden donation box where I could hear the clang of coined pesos distinctly drop in as people approached the statue, placed their hand on it and whispered their petitions before silently walking away. There were perhaps seventy people in line just during the time I was there, probably many more had been there before I arrived. That’s a lot of petitions to remember. I glanced over the heads of the people crowded inside the main church room but couldn’t really see much so I decided to make my way back to the street. Vendors sold candles, flowers, boy-band posters, plastic machine guns and light-up sabers just outside the gate. Nothing there I really needed so I resumed my trek home as I walked down the street in the early evening. I had no solid idea how far I was from my studio but I did know I was on the right road. I geared myself up mentally for a 2 mile walk and kept on going. Since the sun had officially dipped down the horizon I felt it was now okay to relieve myself against a nearby wall. Locals will pee in broad daylight all the time. Me, I prefer at least some privacy of darkness if I absolutely must ‘go’ outside. Onward I walked. Another text for money. That’s not gonna happen. I kept on walking for maybe ten minutes more when I realized that I was already back to my neighborhood. I kept on going to a place I enjoy for some fresh cooked skewers with rice and enjoyed some dinner. I just can’t get enough of this grilled chicken with rice.. good stuff and low in fat. I imagine foreigners may come to America and think all New Yorkers are loud or all Californians are bizarre. There’s some truth to that, but you get all kinds anywhere you go. I try not to make any presumptions based on how any one Filipino behaves. I try to look at the overall curve of statistics. And at the end of the day I gotta say, I am so glad I moved here. Previous Post:Siesta, Dinner and ‘Not My Cat’..
Learning a lot about Cebu from someone with a great flare for life and language. its very interesting. keep it up and explore more places! Every day.. it's something different. ha! Yep. I went back on Sunday to do a photo-shoot but it turns out Fri/Sat are the big carnival days. I added to the diary about what happened instead if you wanna check that out. I’ll go back this Friday during midday to get the photos.. the whole scene kinda reminds me of that scene in Pinocchio where all the kids end up gambling. (no smoking cigars though) ha! As for ladyboys, when I was in the States all my life (49 years) the only time I saw them was during my trips to the Garment District in L.A., Hollywood or San Diego.. once in a blue moon in the bigger city of Riverside, CA. Anywhere else, never saw them. Here, even on sleepy little Mactan, they are working in the malls, the marketplace and.. enjoying the carnival. I’ve heard that over in Angeles City and other large metro areas there are even more, so it’s kinda common here despite the whole Catholic influence. It takes some getting used to, just acting ‘normal’ if talking with them. Didn’t have to deal with it so much before.